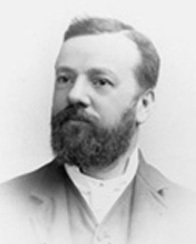 Charles Batchelor, one of Edison’s most valued assistants. Courtesy: Smithsonian Institution. Charles Batchelor is famous as being Thomas Edison’s “right hand man” during much of Edison’s long and prolific career. In his rarefied position Batchelor was involved in some of the greatest inventions and technological developments in history. Batchelor was born on Christmas Day, 1845, and raised in Manchester, England, then the heart of the British textile industry. The textile industry employed many engineers and mechanics, including Batchelor. He was apparently working for a textile equipment manufacturer in 1870 when he was sent to the United States to install some equipment in a Newark, New Jersey textile factory. At this time, Thomas Edison’s main laboratory and shop were also located in Newark. Edison met the 25-year-old Brit, and the two formed a working relationship that would last for years. While Edison basked in the spotlight of fame, the self-effacing Batchelor made his contributions behind the scenes. Over the course of several decades, Batchelor assisted Edison with some of his most important projects in the fields of telegraphy, telephony, the phonograph, and electric lighting. In 1873 Edison named “Batch” his chief experimental assistant. Together Batchelor and Edison would come up with prospective products. Edison also frequently entrusted him with responsibility for special projects, such as setting up a demonstration lighting system at the International Electrical Exposition in Paris in 1881. In fact, Batchelor stayed in Paris for the next three years as manager of the Edison electric light companies that were established there. It was Edison’s practice to give his key assistants shares in his companies and to let them invest in the business ventures that resulted from their inventive activity. Batchelor received shares in the Edison Electric Light Company (found in 1878) and later invested in the Edison Lamp Company (founded in 1880), the Edison Machine Works (1881), and the Edison General Electric Company (1888). He even managed the Machine Works for several years. Eventually, he was named treasurer of Edison General Electric when it was created in 1892. He held this position until 1899, when he returned to New Jersey to work on Edison’s ill-fated ore-refining project. Batchelor left Edison’s employ to pursue work elsewhere after the failure of the ore-refining business (in which he was a large investor). He traveled with his wife Rosanna and their daughters, worked selling securities, and eventually became president of a foundry company. Batchelor died on New Year's Day in 1910.